A midweight version of Icebreaker's best-selling Oasis that’s ideal for skiing, hiking in cold conditions, and everyday winter layering, the Tech Top Long Sleeve Half Zip features the soft, breathable and naturally odor-resistant benefits of 100% merino wool. Offset shoulder seams prevent friction while wearing a pack, while forward-set side seams and flatlock stitching eliminate chafing when you’re on the move. The shirt’s half zip design makes for easy layering and quick temperature regulation. Tech Top LS Half Zip - Mens is rated 4.9 out of 5 by 12. Rated 5 out of 5 by joutpaddlin from Ideal base layer for Atlantic Canada weather Atlantic Canada weather is great when you dress for it! I paddle, cycle, tele ski, walk, run, remove snow, cut grass ... and these days, there is nothing else I'd rather wear as base layers than merino. 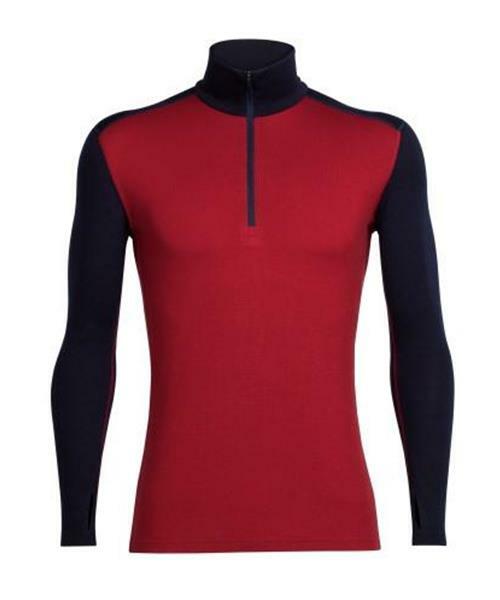 Icebreaker offers an amazing array of base layer options. Their weave is the best I've seen so far in the industry of merino--blend or no blend. Each garment I've used also promises to be durable. Rated 4 out of 5 by Garnett from Continue to Love In Spite of Quality Slipping I’ve been a buyer of this particular product numerous times over the last several years - I wear it a lot! I continue to love it - Fit, comfort, look, durability - however I feel that the quality of the fabric has slipped in recent years. Fabric does not stand up to repeated washings like it used to. Rated 5 out of 5 by Outdoorsman89 from Excellent layering piece. This is the second one I've bought. I use my other one so much, that I figured I should have a pair of them to get me through a week. I use this top through most of the mid-late hunting season, as well as for winter work and skiing. Rated 5 out of 5 by beice from Comfort and Joy I have several similar Icebreaker tops. This one has a better fit(for me) than the older versions. So that's good, clean fitted fun. fabric feels a bit tougher than my older tops, but they are still wearing well. This one then will probably last forever. recommended, for sure. great new mid- blue color too. Rated 5 out of 5 by Dauphinee from Son's Go-To Top The Tech Top was my teenage son's favourite piece of clothing for two years. In spring and fall, it's his sweater and in winter it is the extra layer of wamth he needs. The fabric is soft and the seams don't bunch. The Tech Top washed well and never piled.